We interrupt this marathon of costume production to bring you a vision of my future crafting space! For over a month and a half the upstairs has been in a state of transition. 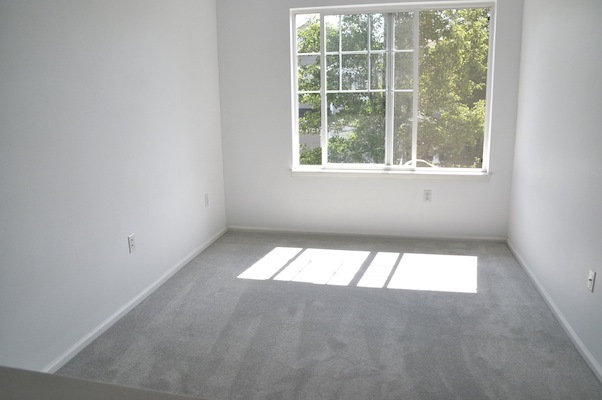 On July 4, Greg began painting the walls & ceilings, tearing out carpet, installing a wood floor in the bedroom, and waiting on the carpet in the loft to be replaced. 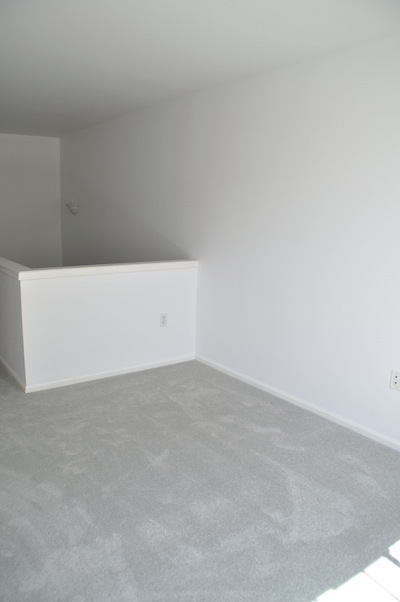 Today, the carpet was installed and the upstairs is a blank canvas. As a result, I have been sewing in the middle of our living room, rather than upstairs in my loft. Most of my sewing supplies were relocated into the former guest room (currently referred to as our Room of Requirement) and my dressform took up residence in our bedroom. This displacement occurred during the pre-PAX sewing season and Greg has been very gracious and tolerant of my sewing sprawl in the living room. It was his home repair plans that displaced me after all. This is beginning to look like a page from an “I Spy” book. The new paint and carpet make the upstairs so much brighter! 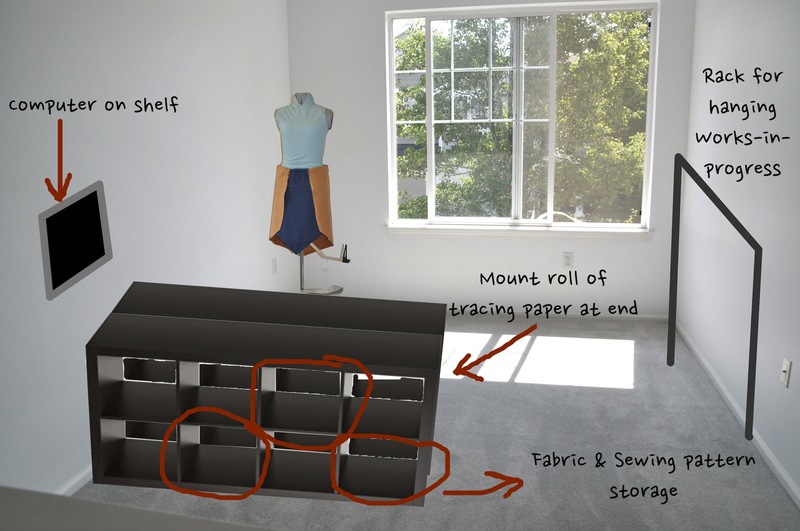 I plan to use two IKEA 4×2 Expedit shelving units, placed side-by-side to create a series of storage cubicles for fabric, patterns, notes, and sewing books. On top of these shelves, I will place an IKEA table top that I already own. The perimeter of this cutting and drafting table may have a few trays or hooks to hold rulers, pencils, and other small tools. I was inspired by Brooke’s sewing room & this sewing IKEA hack. 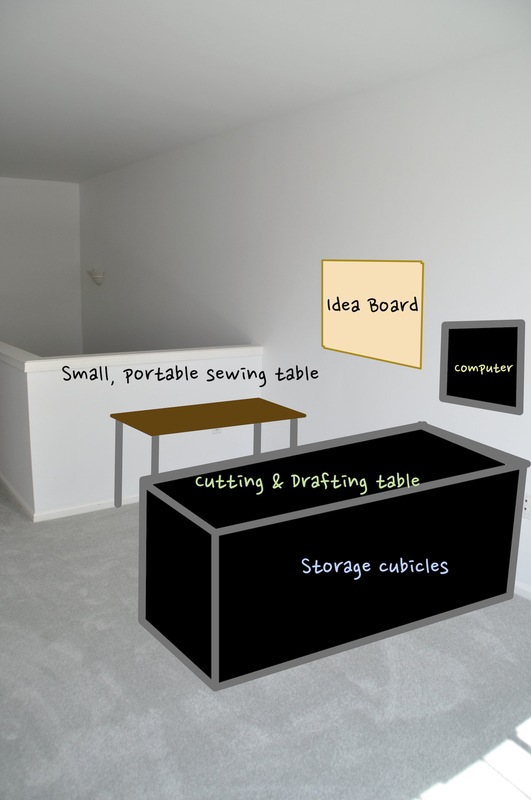 My sewing machine will live on a smaller table that can be moved up against the cutting table for sewing large projects, or moved to a corner when I want to have two projects going simultaneously. Ideally my desktop computer will live on a shelf at the end of the cutting table. This will be my reference computer for tutorials and my entertainment center while sewing. 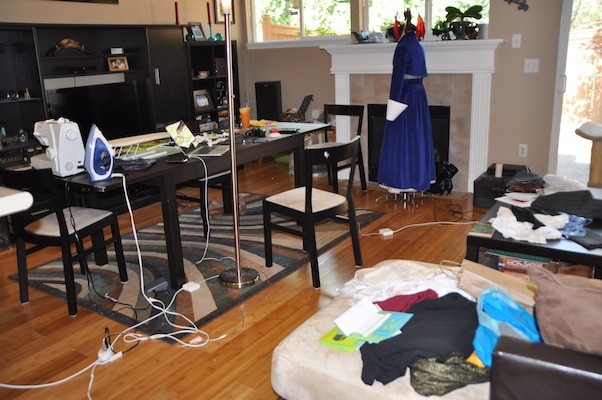 My dress form will live in the corner where there is minimal wall clutter (no outlets, vents, or light switches) to interfere with photographs of my projects. As eager as I am to build this new sewing and craft space, I will wait until PAX has passed. It is very easy to fall down the rabbit hole when you are organizing sewing supplies, and I don’t want to take time away from the costumes that I need to complete. I’ll be showing off some costume photos soon. Not much stashbusting going on right now, but there were a few ingenious thrift-finds that are making my work much easier (and a little more sustainable). Looks like a lovely bright creative space! Good luck with your costuming projects. How exciting! A brand new space just for you. My husband and I have been working out of living room in our three room apartment – this looks like a dream!